We are the chosen sole retailer for Jack Daniel's games room products for the UK and Europe. At Home Leisure Direct we are proud to be the chosen sole retailer for Jack Daniel's games room products for the UK and Europe. Jack Daniel's is one of the most iconic brands in the world, and we are exclusively able to supply games room products bearing their insignia. No-one else in the UK or Europe can provide these officially branded products, and we have worked closely with the Jack Daniel's design team to produce a range of high quality items for your home games room, office or breakout room. 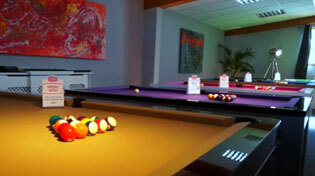 We have a range of Jack Daniel's pool tables, pool table cloth, pool accessories and football tables. We have provided a range of different styles and finishes to allow you to select the right look for your chosen location, along with a choice of the Jack Daniel's trademark logos that you know and love. We can supply slate bed pool tables bearing the iconic Jack Daniel's logo, engraved into the sides and end panel using the latest CNC technology. These tables are available only through Home Leisure Direct and are bound to make a statement in any home. Working closely with our friends at world-renowned pool cloth manufacturers Hainsworth, we have developed two types of cloth onto which we have printed the iconic Jack Daniel's label. Choose from Smart Cloth or Elite Pro Cloth (depending on your needs) and have them applied to any of our pool tables, or apply them to your own table. We offer a range of football tables with the trademark Jack Daniel's logos in place. The players and scorers are all colour coded in either black and white, or black and silver, to stay true to the style requirements of the Jack Daniel's brand. We also offer other games room products with the Jack Daniel's logo, including jukeboxes, dartboards and darts. If you're looking to create a games room with a continuous theme, we can supply the products you'll need to complete your games room look. We understand that with busy schedules, family life and work commitments, not everyone can visit our showrooms, so we will make sure you have all the information you need. If you are unsure about cloth colours or wood finishes we can send you samples out - free of charge - to help you make that decision without stress. If you are concerned about your space, the size of the table or whether or not a table will fit in your space, then you can either download any of our “Will It Fit?” guides or call the team who will happily help you over the phone. We will never tell you an item will fit just to get a sale. You can trust us to offer you honest advice, all of the time, so that there are no unwanted surprises on delivery day. Have Serious Fun choosing your new Jack Daniel's product.